My Review – I am not crazy about the Ultra-Pasteurized organic milks. 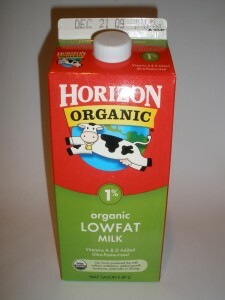 This one, Horizon Organic Milk 1%, did have a better flavor than others I have tasted, it did not have the unusually sweet taste to it. That said I found the flavor to be a bit on the bland side. If you like your milk to just be there without much flavor this would be a good choice, otherwise there are other organic milks that I prefer the flavor and creaminess of, even in a 1%.